The Adamello Brenta Nature Park has an extraordinary fauna, thanks to the environmental integrity and variety of its territory. In the area there are all the characteristic species of the Alps. Among which the ’Brown bear stands out, the symbol of the Park was on the brink of extinction. But today it is expanding thanks to a special reintroduction intervention. Other “big carnivores” (wolf and lynx) are absent, but foxes, badgers, beech martens, martens, ermines and weasels are widespread. Particularly noteworthy is the presence of ungulate. 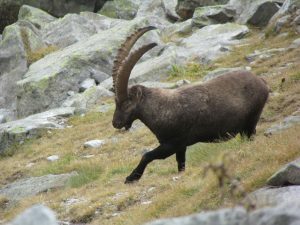 Besides a large population of chamois, the Park includes a colony of ibex, the result of a multi-year reintroduction project. 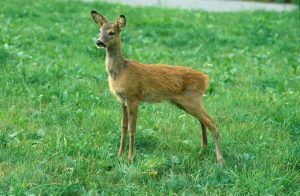 Among the ungulates are also deer, roe deer and mouflon. The latter introduced since the 70s by hunters. The presence of rodents is equally rich and interesting: the squirrel and the marmot are the most widespread and characteristic. The populations of the lagomorphs, the common hare and the alpine hare are also discrete. The birdlife includes numerous species typical of the Alpine environment. 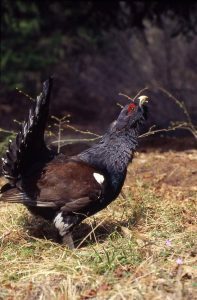 Among the galliforms we find white partridge, rock partridge, black grouse, capercaillie and francolino di monte. Among the birds of prey nest the golden eagle, the buzzard, the goshawk, the sparrowhawk, the honey buzzard and the kestrel. Only the occasional presence of the bearded vulture. Of particular ecological interest, in addition to the picidi, there are also nocturnal birds of prey such as the tawny owl, the long-eared owl, the Boreal owl and the dwarf owl. For the herpetofauna we point out the most typical species of the alpine environment. Among the amphibians, the alpine newt and the mountain frog. Among the reptiles, the viviparous lizard, the asp and the marasso. For the fish, the numerous lakes and waterways host the typical cold water fish, such as the alpine char, the marble trout and the brown trout. For further information on the Park’s investigations into the fauna, documents and reports are available on the page Download.